I'm one of those crazies who actually enjoys running half marathons. Full marathons...no thank you. My crazy doesn't go that far. But half marathons are great - just long enough to feel accomplished and short enough to be fun (not to mention you will still have some free time not devoted to training). This year I put together some information for friends facing their first race. Just a few tips I found helpful when preparing for my first race. 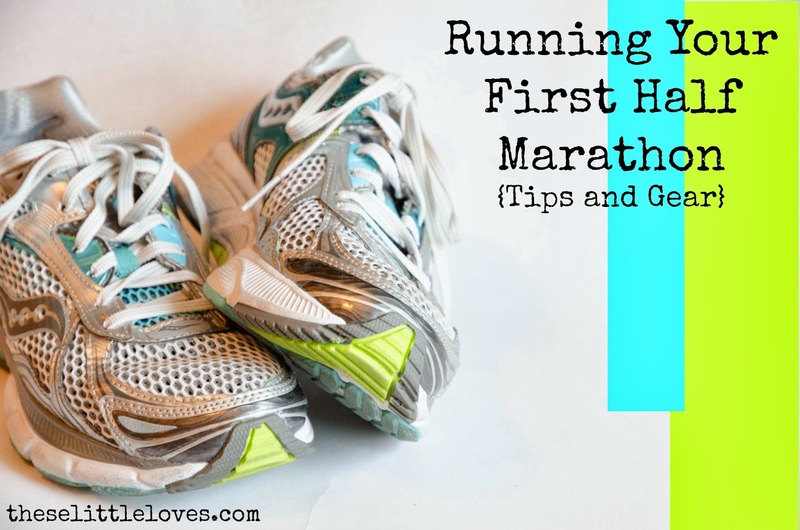 While this list is far from exhaustive, it gives you a few things to consider as you look forward to tackling your first half marathon. The most important advice I can give on how to survive (and dominate) a half marathon is pick a training program and stick with it. There are a ton of options out there - some geared toward first timers, others more advanced. Pick one that aligns with your goals. For example, a training program for someone who is focusing only on crossing the finish line will differ from someone shooting for a PR (personal record). For my first race, I focused on running the whole way (no walking), but was unconcerned with the time. My training didn't have any speed work involved and often I didn't even time my training runs. Now that I have done a few races, I work toward time goals. You will also want to consider the race course. The last one I ran was the Nike Women's Half Marathon in San Francisco. This is by far my favorite race (who else has tuxedoed firemen handing out Tiffany necklaces at the finish line?! ), but man is there a steep hill around mile 6. You will want to look at the elevation changes of the race course (often published on the race website) to determine if you need to include any hills in your training. If you are unsure where to start, I swear by the Hal Higdon's training programs. The 'Novice 1' plan prepared me well for all of my half marathons. The plan is 12 weeks long. I've done both the 12 week plan and a doubled 24 week plan for a bit slower mileage ramp up. GET GOOD SHOES. This is not optional. A half marathon isn't just another jog. You are going to be racking up serious mileage during training. You need a shoe that fits well and provides the type of support your foot needs. Any running shoe store worth their salt will have an expert on staff to watch you run a few paces and give you some suggestions on footwear. And a really good running store will have a lenient return/exchange policy allowing you to try the shoes out on a few runs. The shoes will likely be a bit pricey, but it is worth every penny. You don't NEED much gear for running, but this is a must. The wrong support can cause all sorts of joint or foot problems once you start getting up in miles. Another option if you are having foot trouble - Superfeet green inserts. A few more suggestions regarding shoes: track mileage and size up. There is often a specified mileage limit (e.g. 500 miles) determined by the manufacturer. You will want your race to fall within that range. Regarding sizing, many runners often size up a half or a full size. I typically wear a 7.5 shoe, but my running shoes are at least a size 8. The extra room allows for foot swelling. You won't notice this on short runs, but during 9 or 10 mile runs your foot will swell a bit and might cause your toes to rub if they are too small. When it gets closer to the race you will want to pick a 'race outfit' (including underwear and sports bra) and try it out on some long runs. This will be to make sure you don't get chafing. If you do get chafing you should try other clothing options and use Bodyglide . Not as important as the shoes, but good socks can help prevent blisters and keep your feet dry. I like Wrightsock Double Layer Socks . I have a few pair that I save for my long runs. Your running clothes will likely get stinky with so much use. The absolute best sports clothing wash I have found is Sport Suds. If you run outdoors you will need something to help you track all that beautiful mileage you'll be racking up. The 100% free option is mapping out runs in advance with MapMyRun or Google Maps. I've done this a lot, but it doesn't allow you any flexibility. If you have Nike shoes, Nike+ is a good option. There are also apps on the iPhone/iPod though I haven't personally used these and they require you to strap your iPhone to your arm. My personal favorite is my GPS watch. I've used a few versions, but the one that wins out is the Garmin Forerunner 210 . I had the Garmin Forerunner 410 (now replaced with the 610) version and it was confusing and the darn touch bezel was infuriating. The 210 version is basic, super easy, and gives me all the info I want - and it does instantaneous pace instead of average pace. You should also check out Strava. This website allows for uploading mileage and pace information, tracking your runs and giving you all sorts of fun stats. If you run alone you might want to think about getting a RoadID (www.roadid.com). You can include emergency contact info as well as medical concerns like asthma and allergies. I have one that I wear on my wrist every time I run. If you run at dark, you should consider reflective clothing and perhaps carrying pepper spray. On the really long runs you may find your body dipping in energy. For runs over 6 miles I generally use a Gu Energy Gel packet every three miles. Every runner has their favorite brand and flavor and there is no shortage of options. My suggestion here would be to try them out during training. You don't want to try anything new on race day. For a non-gel version I have also tried Clif Shot Bloks which are basically gummy candy. I've never tried these in a race, but they are great at the finish line. And that is the basics (or at least all I can think of presently). Try to keep your training fun. And let's not forget one of the biggest benefits of running this much...it is no big deal if you sneak another cookie:). May I suggest these?